I am interested to find a machine to hull buckwheat. cannot find a practical way to hull these crops. any suggestions? The manufacturer is Wolf Company, Chambersburg PA, est. 1879. The machine sits in our home (the Riverdale Mill) which is on the National Historic Register. It is in good shape, just a little dusty. I'd like to sell it to someone who will care for it and hopefully use it to educate others and share its history. It is located in Knoxville, TN, and is extremely heavy. You'd probably need 3 or 4 people to move it safely. I live in Akron Ohio. Where can I buy #30 bolting screen?? I am conducting research on my family's grist mill that stood on the Shenandoah River for nearly 200 years. post-civil war era milling; and turn-of-the century industrialization. I would like to sell an old grist mill located on our property in Hancock County, TN. Tyler-Savage equipment in it and grinding stone. Has an overshoot, metal Fitz wheel. Greetings, I'm helping Blue Oven Bakery sell a tractor powered working condition Buhr-Stone Mill. I'm hoping you have ideas as to whether it's worth placing on your classifieds page. Let me know what I need to send your way. Hi, I think we have the ruins of a tub mill or a swedes mill on our property. I think it might predate the "recorded" history of our township, which seems to begin with the arrival of Welsh settlers. I am trying to find pictures of the typical layout or dimensions of such an early mill. The property is along a stream which borders the Schuylkill River upriver from Philadelphia. Do you know of a good source for such information? Thank you! Hello About 30 years ago I purchased the Balls Mills PA cider mill from a Robert (Robby) Brucklacher. I am now planning to finish the restoration and operate as a display. Brucklacher family history, and if any surviving members of Robert's family. Unfortunately I did not get any information from Robert when I purchased the equipment. I do remember there was another operating cider press of the same make and age operating in PA at that time. an item connected to it. Any information you might offer would be greatly appreciated. for a botanical garden in Queen Creek Arizona. Looking for a Miller that might be able to help us set it up! We will have up to 1000 gallons per minute in Flow on a 14 foot wheel. Have acquired an old grain mill. Built in the 1800s and has a good amount of machines and equipment. 5000 sq ft commercial mill. I would like to keep a few things for the building but just about all the equipment will go. Would also appreciate leads to someone that can appraise and/or sell it. Would also consider donating to museum etc. Everything located outside Bedford Pa. Can deliver for a good price. Greetings, I was just given your information as a possible place to sell a sleighmill. I am currently the executor of the property. My folks liked there for 32 years and ran an antique shop specializing in 19th and early 20th century lighting. 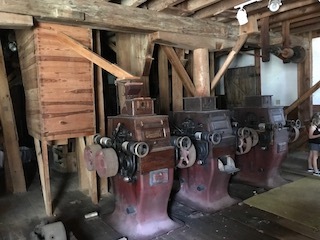 The equipment and several patterns, harness and shaft hardware used still remain on the lower floor. As the use of cars became more popular they did work on them, and produced toys and towel racks to mention a few. written paint recipes on the wall, bills, and records of snow storms. The sleighmill was built, owned and run by the Snow family. It is located on Snowville Rd in Snowvill NH. It is currently on the market with a local agency, here's a link to the their ad. If able to post on yor site any information would be greatly appreciated. Hi to you, I'm trying to find a list of old mill in quebec and nova scotia. I would like to vist/photograph and search for historical. Can you help me find location of old mill in those 2 provinces. 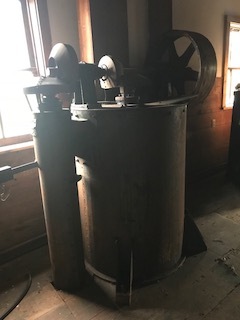 I manage a small electric hydro generator in Southwest Lower Michigan which was originally built around the turn of the century. Currently we have one generator working but there used to be two. The owner wants the second one converted to a grist mill for school children to come and see. I'm new to grist mills and reaching out to your organization for any help you could give. I'm looking for parts and tips from those who may have done this before. 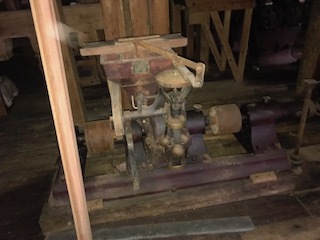 I have acquired a large amount of Milling equipment from a mill In Virginia built in 1900. As well as support equipment. All items are in Sanford, NC. Items: line shafts, corn grinding, flower grinding, amonia pumps, generators, many more, etc. Replies and inquiries to Adam Wengryn at 908-812-1003. Wanted! TIMBER FRAME FOR A MILL. Looking for an old timber frame mill structure to fit (or be fitted to) an existing foundation. The original structure consisted of a timber frame with two shed additions. The additions are not needed as part of the frame; they will be recreated. The dimensions of the foundation are 30' x 32’ 6”. The replacement mill can be a standing structure to be dissassembled and then relocated, or a frame already disassembled and stored. 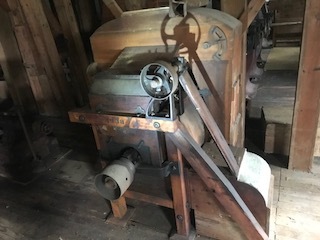 The siding or the mill wheel/workings are not required. 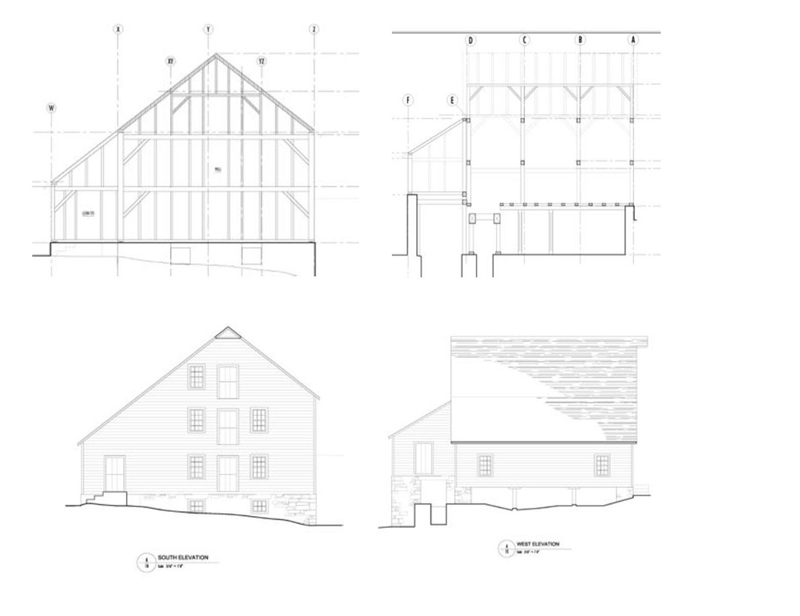 Elevations of the mill that we seek to replace are in the diagram below. Associated gears and pulleys and bearing for remounting. Everything is complete. The following stone and burr grinders are for sale in Bozemen, MT. Note: all grinders are in excellent running condition, complete with drive belts. Would like to find a good home for my collection.